Thank you for all of the prayers, kind wishes, and emails we recieved in the weeks following the wildfires! For those of you who didn't hear about it at the time, John and Kris Erickson lost their home to the wildfires that ravaged the Texas and Oklahoma panhandles and parts of Kansas, and about 90% of the rest of their ranch was burned. But, the great news is that they're already back in the saddle and on the road to rebuilding! And, at the same time, we're all looking forward to the next Hank book, which is currently in the works! We hope you enjoy this early look at the cover, and be sure to check back here on Hank's blog for more information in the days to come! Hank is in deep trouble this time! It’s a blustery day in late fall, and he decides to sneak into the back of the pickup and hitch a ride with Slim and Loper to a neighbor’s fall branding. But he has no idea what’s in store for him! 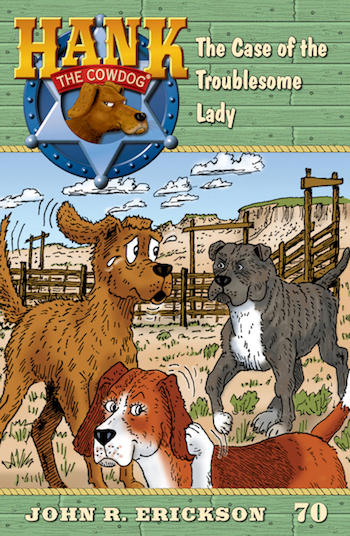 Instead of running into either Miss Viola or the beautiful Miss Beulah the Collie, he finds himself on Baxter’s ranch...Baxter, the cowboy who owns the beautiful Miss Scamper the Beagle. However, Miss Scamper has always been a bit hard to figure out, and Hank just can’t decide if she’s crazy about him...or angling to land him in a heap of trouble with her boyfriend Steel, the pit bull. As always, we LOVE hearing what you think about the upcoming Hank books, your guesses about what'll happen, favorite Hank memories...everything! And we hope you'll share them with us in the comments-section below!